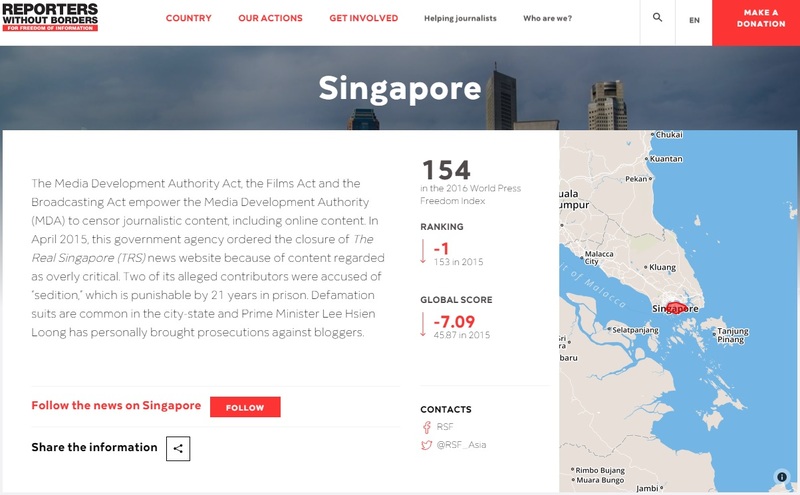 Reporters Without Borders has just released its 2016 World Press Freedom Index, where Singapore fell one place from last year's lowly 153rd ranking to an even lowlier 154th position out of 180 countries. It has become a cliche to use this ranking to bash "mainstream media", specifically the news outlets of SPH and Mediacorp, and the journalists who work for them. I find this terribly ironic. For one thing, Paris-based Reporters Without Borders is a pro-journalist organisation. It doesn't distinguish "mainstream media" from so-called "alternative media". It advocates freedom of information for all and seeks protection for journalists and bloggers alike. What many would take the World Press Freedom Index ranking to mean is that Singapore's press is 154th in the world when actually it's Singapore's press freedom that's ranked 154th. It is an important distinction. While you may argue that the lack of press freedom leads to a lousy press, let's not confuse the two as the same thing. In fact, I would argue that what the low ranking shows is not how bad Singapore's press is, but how hard it is here to be a journalist at all. It's like being a fireman in a volcano. The odds are stacked against you, but you still got to do your job the best you can. On the other hand, if you want to use the ranking to bash the Government for creating such an environment, that's perfectly fine.